I love baking, its the best way for me to de-stress after a long day at work. When I first got into it my tools were so basic and minimal. 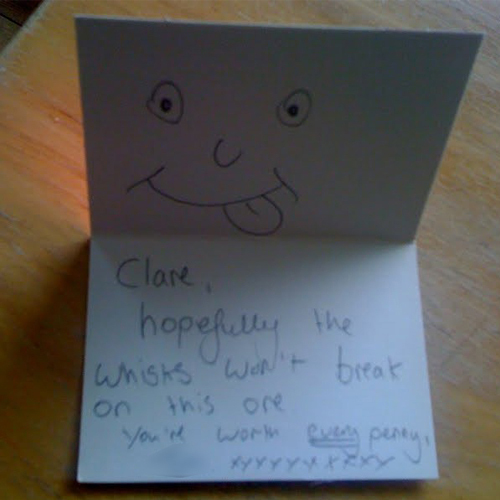 I had my trusty electric whisk from Asda that cost me the grand total of £5 but it did well and I managed to get a good 3 years out of it before it died. I was desperate for a mixer and I kept saying to Himself that if we ever got married I only wanted a wedding list so I could put a mixer on it. I remember being in Lakeland with mum one day and pointing them out to her and saying how much I wanted one but they were way beyond my price range. Anyway so I'm looking on eBay wondering if I could pick up a cheap one second hand and I managed to get one for about a tenner. I can't remember the make of it, it was just a bit old and battered but Himself said he could bring it into the workshops at work and clean it up for me. He did and a few days later I decided to try it out but the whisks snapped straight off and into the mixture. I was not happy! So the next day I get in from work (He was working late) to find this massive pink box on the kitchen table with a lovely gift card. Honestly I was shaking as I opened it then phoned Him and he said "the money I spent on that is worth more to you and I know you will get more enjoyment out of it." I couldn't wait to try it out and I have been in love with my Kenwood every since. Touch wood it has never failed me even when I pushed to its limits when my MD asked me to baked 150 cupcakes for our client party last summer. 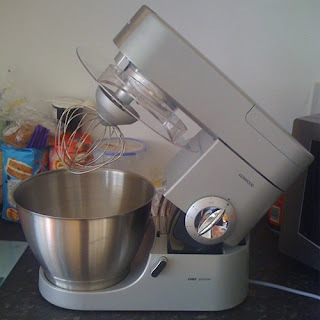 I love my Kenwood and I love Himself even more for buying it for me - see dreams can come true!